Lombard Street a Toll Road? Home » News » Local News » Lombard Street a Toll Road? The famous Lombard Street in San Francisco could be in for a big change. 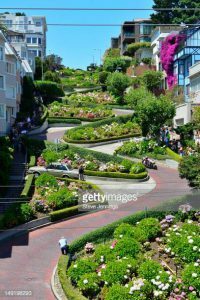 City and state officials announced a bill yesterday that would establish a toll and reservation system for the famous street that would charge site seers up to $10 dollars to drive down the windy steep hill which has been an international tourist attraction for many years. The purpose it to establish a crowd control system that will manage the thousands of visitors that cram the narrow streets and sidewalks. In the Summer months, as many as 6000 people a day visit the crooked street. Residents built the famous street with red brick in 1922 but because it was a 27-degree grade it was too steep for the autos of the time to drive. Home owners then planted lush gardens with hydrangeas and roses in the early 50’s. The city needs state approval to charge a toll, but city officials would determine how and what to charge, and how to use the funds. The new system is expected to operational in the year of 2020.